This bowl is a bit of an adventure, inspired by a vegetarian cookbook gifted to me (thank you Elke!). 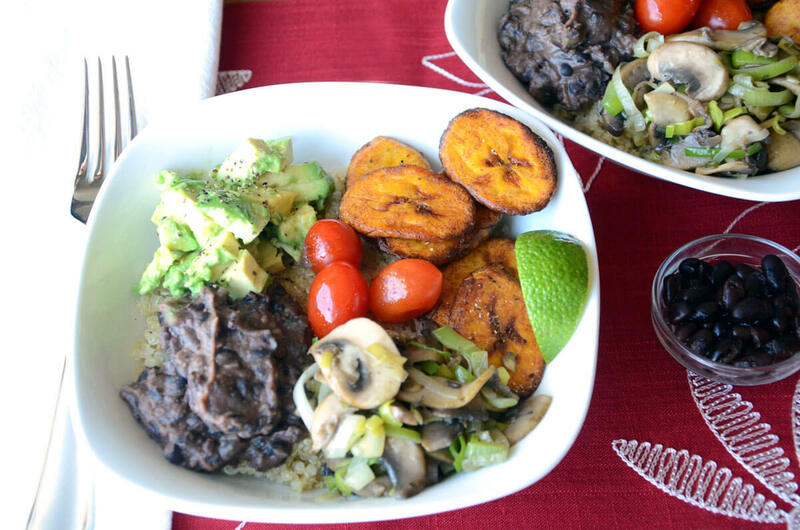 It starts with a base of quinoa, and is topped with flavorful and spicy black beans, earthy sautéed mushrooms and leeks, creamy avocado and lime and fried plantains! Be sure to buy ripe sweet plantains that are yellow and brown, not the green ones that are very starchy. Make sure to serve with lots of lime wedges, and some salt to sprinkle on top. The lime brings it all together! To prepare the beans: Place the diced jalapeno in a sautee pan with oil and heat over medium heat. Sautee for 1-2 minutes, then add drained black beans and cinnamon and cook for 2 minutes. Add ½ cup water and smash slightly with a potato masher. Transfer to a bowl. Wipe out the sautee pan and add another TBS oil and add leeks. Season with salt and pepper. Once the leeks begin to soften and start to brown, add the mushrooms. Season again. Cook until the mushrooms are browned and transfer to a bowl. To make the plantains. Peel the plantains and cut into diagonal slices about ¼ inch thick. Heat up the sautee pan and fill with about ½ inch oil over medium high heat. Place plantains in the suatee pan and fry until well browned on each side. Remove and place on a paper towel lined sheet tray. Salt hot plantains. Place the cubed avocado in a bowl and squeeze one lime into the bowl. Stir to coat the avocado and add salt and pepper. To assemble: Place the quinoa on the bottom of each bowl. Organize the various toppings in sections on top – beans, leeks and mushrooms, avocados and plantains. Serve with lime wedges and squeeze a healthy amount of lime on top, especially on the plantains. What’s for dinner? How many times did you hear that question and didn’t have a proper answer? Plan your next week’s dinners and save time, money. And guess what, all recipes are tasty and healthy! © 2018. TasteGuru All rights reserved.